Looking for trouble, Ellery Queen descends on a small town. The mystery author is hoping for fodder for a novel, and he senses the corruption that lurks beneath the apple pie façade. He rents a house owned by the town's first family, whose three daughters star in most of the local gossip. One is fragile, left at the altar three years prior, never to recover. Another is engaged to the city's rising political star, an upright man who's already boring her. And then there's Lola, the divorced, bohemian blacksheep. Together, they make a volatile combination. Once he sees the ugliness in Wrightsville, Queen sits back - waiting for the crime to come to him. ©2014 Ellery Queen (P)2014 Blackstone Audio, Inc.
Not the usual smug Queen. This book has an intriguing and convoluted plot, full of emotional highs and lows. Stay with it to the very end. The early Queen tales were mostly puzzles. The middle period Queens are very different, focusing on characterization and the psychology of the characters involved. 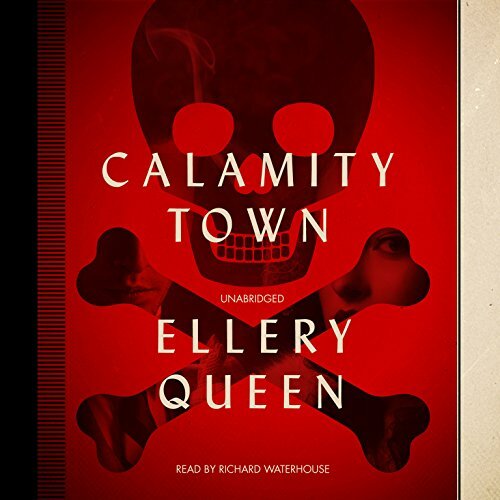 Calamity Town is set in the fictional New England town of Wrightville, and Ellery immerses himself with the Wright family and their troubles. Here he is not the aloof reasoner, but someone who cares deeply about the family, especially young Patricia Wright. There are, it seems, two types of narrators of audio books: the ones who simply read the book, and the ones that perform the book, giving each character life. Waterhouse is definitely the former type, but at least he has a pleasant voice and differentiates the different characters a little. Thought i had it figured out pretty early but too many twist and turns later i was still guessing.